With this iExpression the property is automatically increased (or decreased) by some fixed amount at each marker. In addition, you can overwrite this behavior at individual markers using the marker comments. If a marker has "[-5,20]" as comment, for example, the x value is decreased by 5 at this particular marker and the y increased by 20. 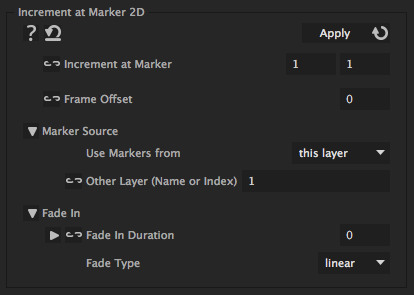 With a comment "5s" or "20 frames" also the fade in duration for this marker can be changed to 5 seconds or 20 frames, respectively.